Game of Thrones returns in April for its final season. The show is considered one of the most well-written pieces of fiction in history. This is partly due to its grand character arcs occurring across hours of screen time. Game of Thrones employs techniques ranging from the Aristotelian Tragic Hero to ancient hero myths. Jon Snow can be considered as a mythological or archetypal hero. There are several criteria involved in the ‘Hero’s Journey’ or the ‘Monomyth’. Essentially, the archetypal hero is an individual who begins in the Known, or Order, confronts the Unknown, or Chaos, with truthful speech and action, thus creating order from its pieces. The archetypal hero is confronted with temptations and challenges during this confrontation and must overcome them with his gift of truth. The hero often suffers a tremendous loss during this confrontation, enduring a death and rebirth in the chaotic abyss. This encounter with the abyss, and the subsequent rebirth, enlightens the hero with the wisdom of the Father, or culture. The Father exists in the underworld following his death at the hands of evil, to which he was wilfully blind. This transformation leads the hero to return home and embed his newfound wisdom into the world. Jon Snow begins his journey at ‘The Wall’. In mythological terms, this is symbolic of the border between Order (Westeros) and Chaos (North of the Wall). 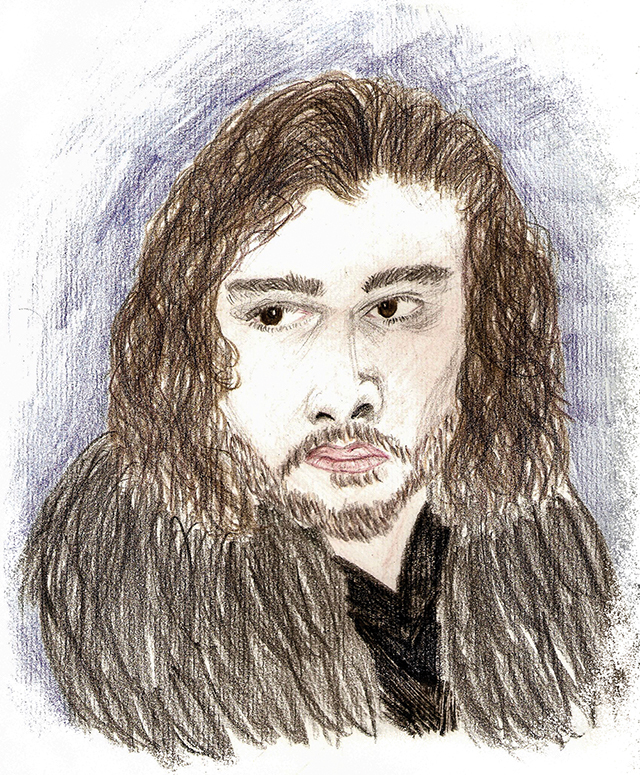 Chaos is further symbolised in the Wildings, who Jon’s order, the Night’s Watch, are sworn to keep out. Jon just about resists these temptations, at great personal loss, and returns to the Night’s Watch with a newfound appreciation for the Unknown. Not long after, he attempts to integrate the chaotic nature of the Wildings into the ordered society of Westeros. This attempt is met with betrayal from his fellow brothers-in-arms. He is murdered by this manifestation of corrupt Order. This story beat draws on the mythological theme of the stagnation and corruption of culture. This literal and symbolic death transforms Jon. He recognises the capacity of Order to denigrate into tyranny. Upon his rebirth, the corrupt aspect of Order is defeated by the newly integrated chaos, the Wildlings, and Jon is given new purpose. This integration of wisdom is the Atonement with the Father. Ned Stark was a virtuous ruler, but he was wilfully blind to the existence of immortal evil present in society, causing his demise. Despite being shaken by his death and resurrection, his sister Sansa returns, and guides him towards his home, where he must supplant the tyrannical ruler, Ramsey Bolton, and reorder society with his newfound wisdom. His army is enlisted with truthful speech; Jon doesn’t lie to his followers, they follow him because they believe in him. He confronts the manifestation of tyrannical Order in the ‘Battle of the Bastards’. However, he is almost defeated by this opposition. A final step in the hero’s journey, as he attempts to return home, is the Gift of the Goddess. Sansa, another symbol of benevolent, nurturing Chaos, gifts Jon with more soldiers, and the battle is won. Finally, the Lords of the North elect Jon as their king, in a mythological process known as the hierarchal organisation of the gods. These ancient, archetypal themes are, in part, why Jon Snow is so popular. These themes resonate with people on a profound level, as they have been abstracted over millennia. This is the genius of Game of Thrones.